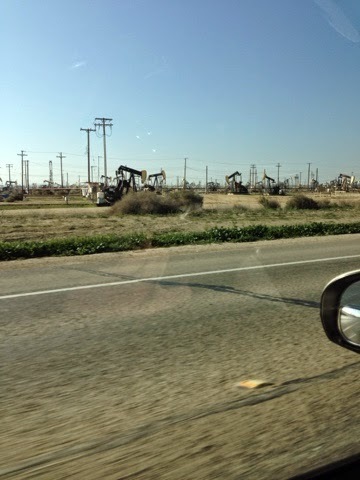 Picture of land of the California Central Valley after getting out of the mountains north of LA on I5. I awoke at 3:45 am at the casino parking lot near I10 west of the LA area on my first real night of stealth parking. My night of stealth parking at the casino worked fine. With the Mass legal tinting I had put on the Prius before I left and the black cloth shades I have, people outside can't see in the car and can't tell I have shades or if anyone is in it. The curtains are not dark enough to get away of having a significant light on inside the car without being seen outside when it's dark. So I am careful to keep light to a minimum. On my cell phone I turn down the brightness down when I am doing my blog. The key to stealth parking is to set up the car for stealth as it is getting or already dark. I did go into the casino after dark but was careful to see that that you can get out of the car in such a way to not draw attention or be seen. The same goes for returning to the car and avoiding or drawing attention. Having a dedicated seat behind the driver's seat allows for a graceful in and out of the car. 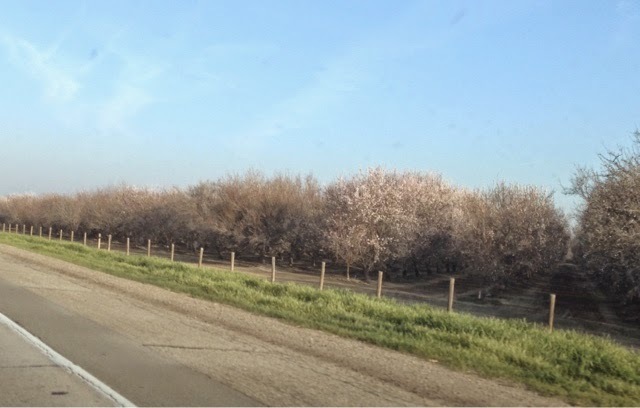 Trees in the Central Valley of California. Today was was a 6+ hour drive day without stops. Since I started driving just after 4:10 am there wasn't much to see in the dark for miles along I210 fro I10 to I5 north before it became daylight. The first truck stop that I tried I got gas but there were no showers available due to lack of hot water. I moved on to the next truck stop in Lost Hills, CA and got my shower. After my shower and McDonalds for downloads I was off headed east to US101. I passed these oil or gas pumps. 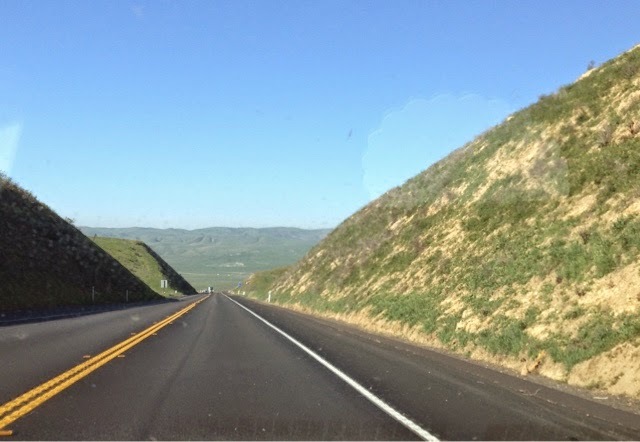 These are the mountains off to the south of myvdrive to US101. Eventually the road turns into hills. 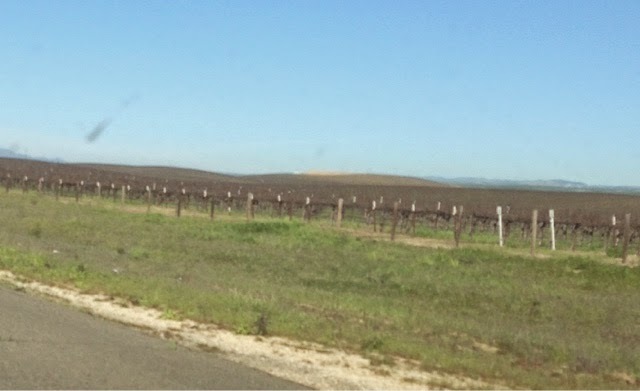 Finally I am in the lower Salinas Valley with many Vinyards. 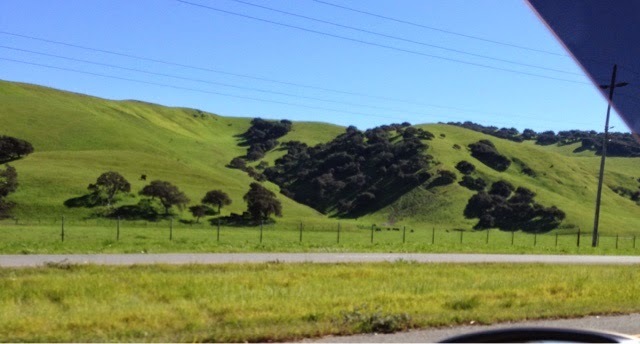 My last stretch of my travels today take me on CA 68 from Salinas to Monterey past lush green hills. Finally I arrive at son Clayton's and family's house. Since I last filled up I got 61.4 mpg. Another great Prius segment. 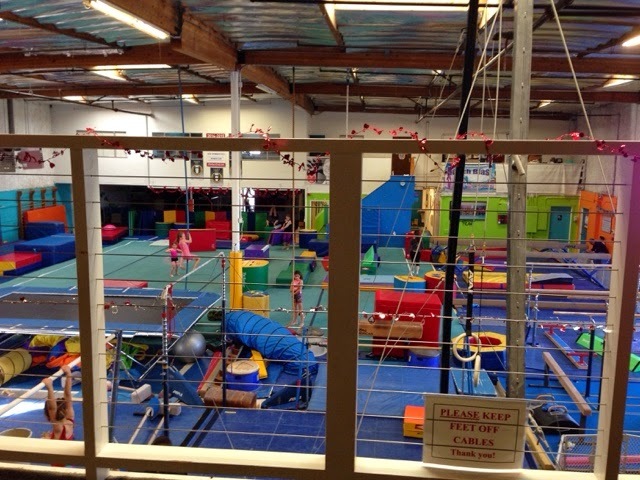 My oldest Granddaughter had gymnastics today and after a stop at the grocery store we saw the Goodyear Blimp flying back to the Monterey Airport for the night. It is in town for the PGA Tournament in Pebble Beach.